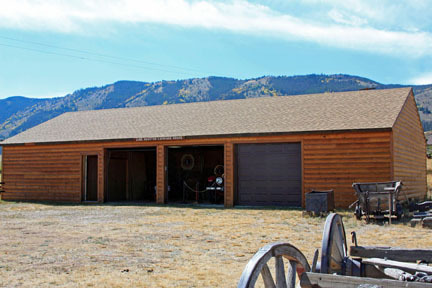 The Jane Houston Carriage House was built on the grounds to house some of the larger pieces of ranching equipment in the museum’s collection. It also houses a very small office and a storage room. It was dedicated in memory of Jane Houston on July 2, 2005. Jane was a founding member of the Centennial Valley Historical Association, and served as the group’s president for many years. She died in February 2005. 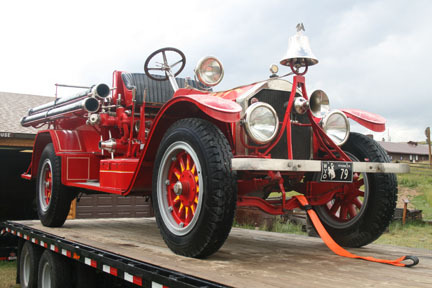 In addition to the ranching equipment, and a large collection of tack and harnesses, the carriage house is home to a 1917 fire engine, originally part of the Laramie Fire Department, on loan to us from the Laramie Plains Museum, restored by the students at WyoTech, and delivered by the Centennial Valley Volunteer Fire Department on August 5, 2010.